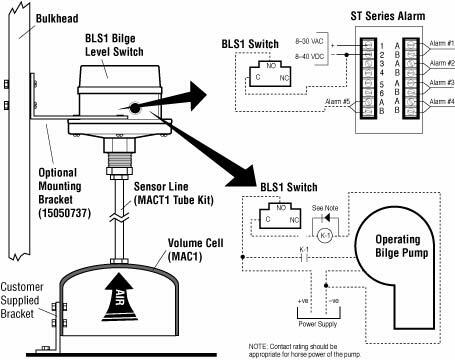 The BLSK1 Bilge Level Switch System operates bilge pumps or alarms. The kit includes all items and fittings necessary to install in your bilge. You order only the parts you want, and you provide brackets, tubing and mounting hardware. Using the proven Air Cell actuating system, all moving parts and switching are remote from bilge liquids and are not affected by corrosion, rust, etc. All wetted parts are of non-corrosive materials. 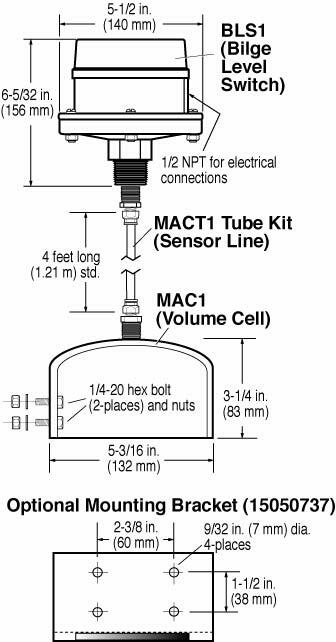 As bilge level rises, a column of air is captured in the MAC1 Air Volume Cell. The rising bilge level compresses the column of air creating pressure against the large diaphragm in the BLS1 Bilge Level Switch and the switch trips. Switch set point is adjustable. The switch resets as the bilge is pumped out and the air cell recharges itself during normal operation. The BLS1 is constructed of materials not affected by marine atmospheres: aluminum or bronze body and cover, Buna-N diaphragm.